I enjoy walking outdoors in most weather, but deep down I am not a winter person. With the weather forecast predicting record-breaking double-digit (Centigrade) temperature, I made sure I woke up early to join my walking group this morning. What a difference it was from our winter training walk last week. The road was clear of snow and there were but few icy patches. The training route was aimed to prepare for the Around the Bay (Hamilton Bay, Ontario) Road Race and we headed along York Boulevard, crossing the T. B. McQuesten Bridge to walk down Valley Inn Road. 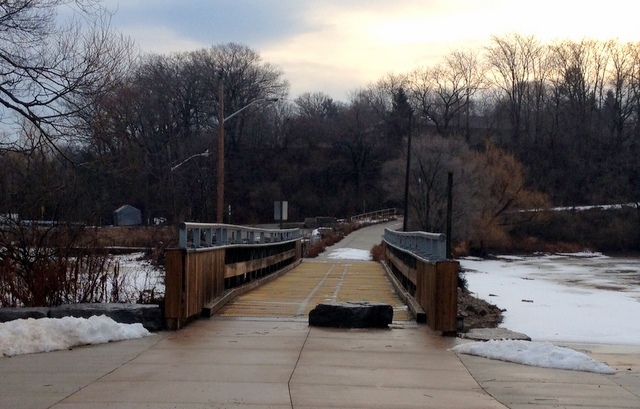 The foot bridge that was covered in snow only a week ago had a totally different look! 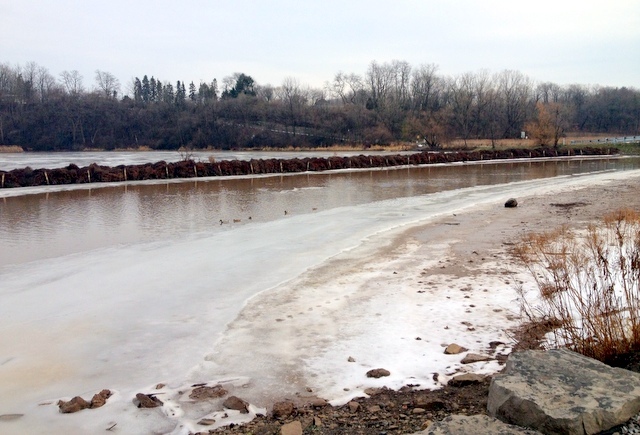 The ice of the harbour had melted. I took a photo of the grounds of the Royal Botanical Gardens last week, and that was how it looked this morning. 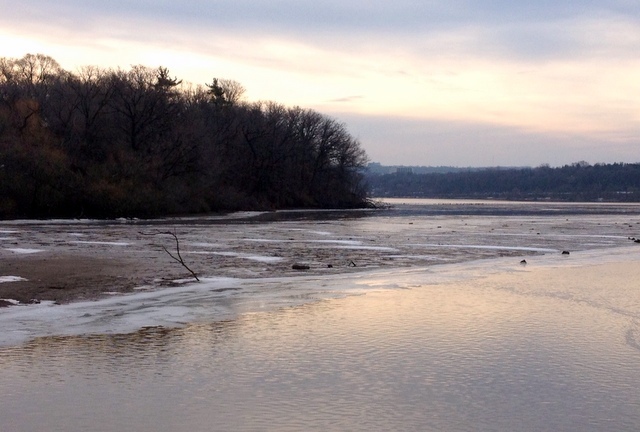 January thaw did its job. More people came out for training, and some runners were wearing shorts. Who would want to waste this beautiful spring-like day hibernating at home? 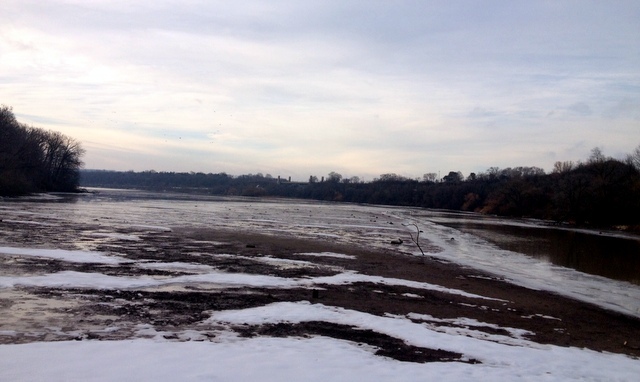 When we looped back, the tide had ebbed further exposing the muddy bottom of the bay. 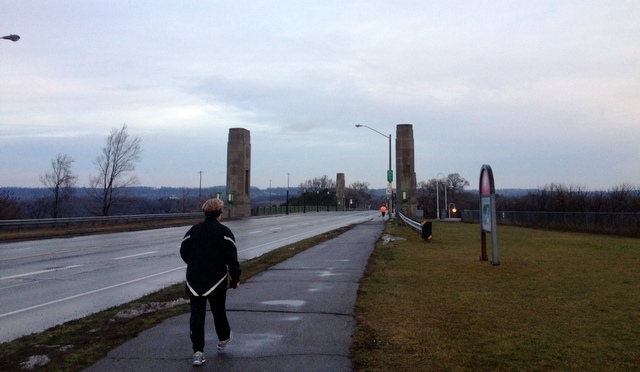 At a distance, the towers of McQuesten Bridge rose from the horizon. 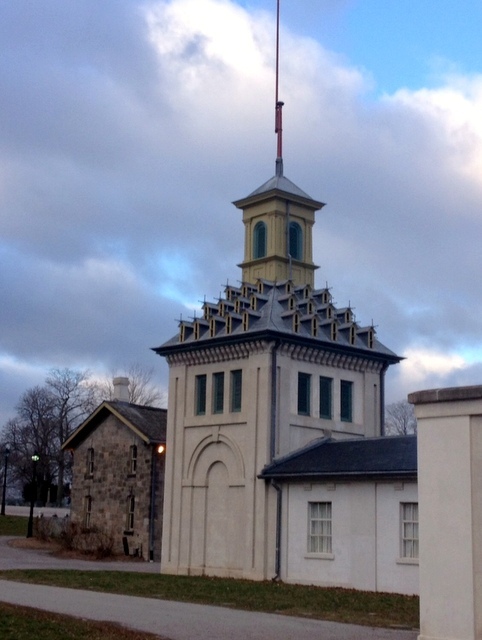 One uphill and we were back into the historical part of Hamilton—Dundurn Castle and its East Tower with bird houses on the roof. In this pleasant weather, we walked the same distance as the previous week but we took ten minutes off our time and this meant we headed out earlier to reward ourselves with a breakfast in town. 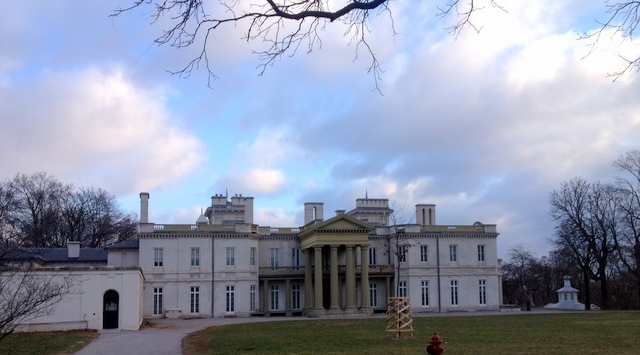 This entry was posted in Nature, Walking and tagged Around the Bay, Dundurn Castle, Hamilton, Valley Inn Road on January 14, 2013 by Opalla. It’s so nice to have warmer weather during the winter! So true, and when it is not snowing, it is lovely. Thank you for liking my post and your comments. I totally agree that as long as there is no snow and the sun is shining, cold does not matter. I used to live in England for nearly 10 years and we have more sunshine here in Canada. I have nominated you for The Versatile Blogger Award! I enjoy reading your posts. Display it with pride.